Whether you are trying to channel your inner Blair Waldorf or you just plain love bows, here are eight ways to pull off a bow in your hair. I love the ribbons tied into floppy bows- they remind me of my childhood. Don't know if that's a look I should be going for but hey, I dig it! 1. Pin your bangs/ bangs area up and to the side with a little bow clip. 2. Put a big bow behind your high bun. 3. Tie a ribbon into a bow around your high pony. FAVE. 4. Pin the top half of your hair up with a bow clip. 5. Low half up half down secured with a bow. 6. Side pony secured with a bow. 7. Tie a ribbon into a floppy bow at the bottom of a side braid. 8. Tie a head scarf into a bow around your head- like a headband! They look so cute, I especially like number 2, how do you do your hair in a bun like that? i LOVE bows! bows make everything prettier / happier! I love this! I really like numbers 2 and 5, I've always been a big fan a top knots. Now I just need a bow collection. 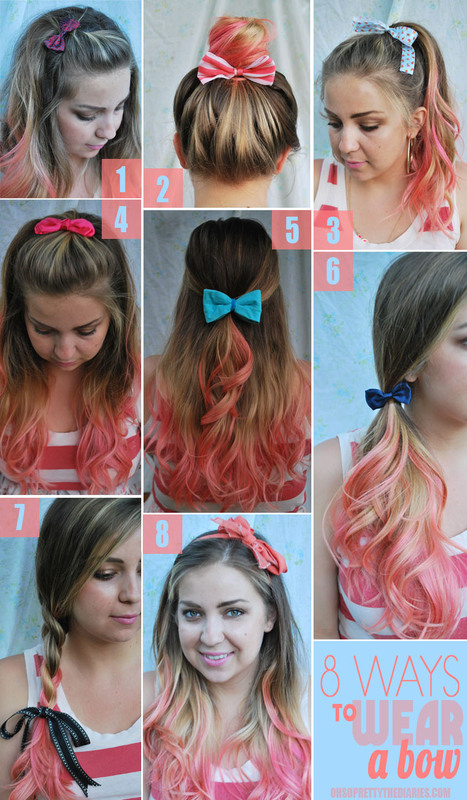 Bows are a fantastic accessory for this summer and I'm LOVING your pink ombre hair. Good tips! I'm absolutely going to pin this for when my bangs get a little longer! Yay! I love bows so much. This is perfect for my "I Heart Bows" board on pinterest! :) Im even making some really cute bow necklaces - we'll see how those work out! So cute. I love the pink in your hair! Super cute! Can't wait for my hair to grow out and then I can put it in a top bun (like #2)! Love 3, 5, and 7! Um... this is uh-mazing. Love it. Genius.